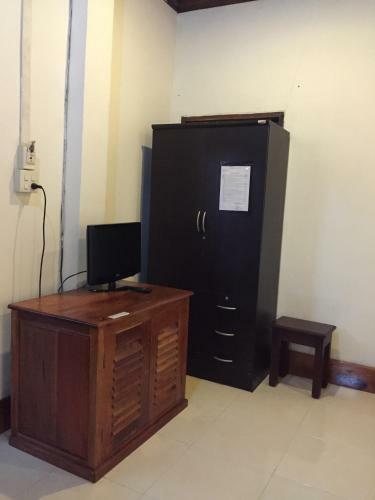 A 1-minute walk to Mekong River, Mekong Moon Inn offers air-conditioned rooms with free Wi-Fi. Staff at the 24-hour front desk can assist guests with airport shuttle and bicycle rental services. Guests can use a desktop computer equipped with internet access at the lobby for free. The property is a 2-minute walk to the night market and the tourist information centre. It is a 5-minute walk to Phousi Mountain and Royal Palace Museum. Luang Prabang Airport is a 20-minute drive away. Rooms are furnished with simple décor. Each room comes with a TV and an en suite bathroom with shower facilities. Located in the new building, this air-conditioned room comes with a TV and an en suite bathroom with shower facilities. Třílůžkový pokoj s balkonem a klimatizací.